It requires careful, knowledge-based planning that includes consideration of genetic aspects – among them, suitability of germplasm to the site, quality/quantity of the genetic pool used, and regeneration potential. The study highlights the breadth and depth of genetic aspects that need to be considered in ecosystem restoration using native tree species. And it offers recommendations for researchers, policy makers and restoration practitioners to better address deficiencies that could compromise the success of some restoration efforts. It brings together the existing knowledge on genetic issues in ecosystem restoration, identifying knowledge gaps and areas needing further research and development efforts. The study’s editors – nine of them, from six different organizations – point out that the adoption of the United Nations Convention on Biological Diversity for 2011-2020 calls for 15% of all degraded lands to be restored by 2020. That’s 150 million ha of degraded land to be restored. That makes it extremely important that such massive restoration initiatives be carried out using the best available information to increase the probability of success and cost-effectiveness. The impact of planting genetic materials that are mismatched to the site conditions may become obvious within a year or so, but the negative effects of restoration based on insufficient diversity will be seen only after many years, they add. Underlining the importance of planning, they note numerous past restoration projects that – undertaken without due diligence – never achieved their expected goals. — Evaluate the impact of different restoration methods on the genetic diversity of restored tree populations. — Develop protocols and practical indicators to monitor and evaluate the genetic diversity of tree populations in restoration efforts as an indicator of the viability and resilience of ecosystems. — Give priority to native tree species in restoration projects. — Given the uncertainty of future climate, promote resilience by maximizing species and genetic diversity from sources that are similar to the site conditions, encouraging gene flow and generational turnover and facilitating species migration to allow for natural selection. 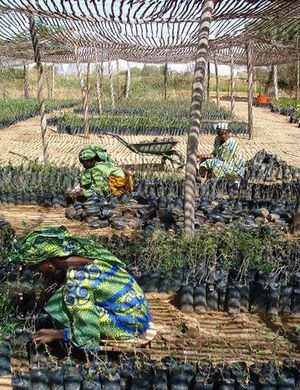 — Put in place supportive regulatory frameworks that guide the production and supply of propagation material of native tree species and the use of adequately diverse material of appropriate origin in restoration efforts. — Broaden education and training curricula to promote understanding of the importance of using native species and genetically diverse and appropriate propagation material, as well as appropriate approaches in restoration projects. 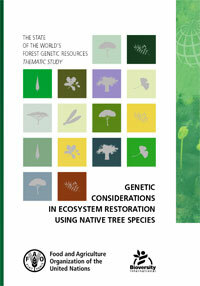 The thematic study was coordinated by Bioversity International as an input to the FAO report on The State of the World’s Forest Genetic Resources and is an important step in the implementation of the FAO Global Plan of Action for the Conservation, Sustainable Use and Development of Forest Genetic Resources.